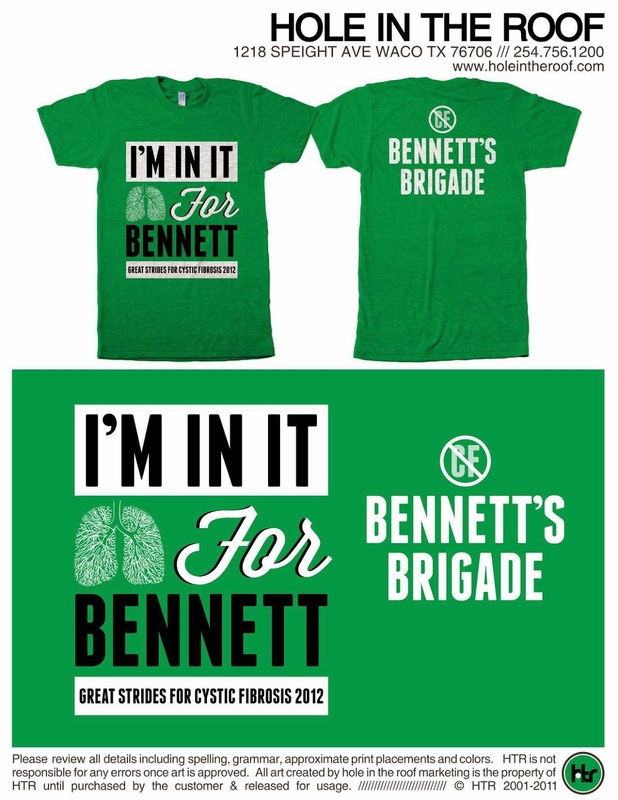 I am super excited about this year's Bennett's Brigade T-shirts! They were designed by our friend Melissa and we think she did a great job! This year's t-shirt is for $15 ($5 from all adult shirts will go to the Cystic Fibrosis Foundation). However, anyone who donates $100 or more to Bennett's Brigade will get their tshirt free (so, if you're already donated $100, I'll be contacting you for your address)! The t-shirts will be printed on the Gildan tshirt color called, "Antique Irish Green" with black and white ink on the front and white ink on the back. The t-shirts come in Adult S, M, L and XL (let me know if you are interested in sizes XXL+). The shirts also come in Youth sizes XS (2-4), S (6-8), M (10-12) and L (14-16). Children's shirts will be printed on Gildan Irish Green. Even though the CF Walk isn't until May 19, in order to get t-shirts ordered and mailed out in time, all orders must be received by April 19. If anyone is interested in purchasing this year's Bennett's Brigade t-shirt, please email me at breckgamel at yahoo dot com with your size and address. I will give you an address of where to send a check. LOVE THE SHIRTS!!! We have been stressing over here at our house for over a month now trying to come up with a cool design. =( We have a printer and a few sponsors...now just need a design. UGGG!! No inspiration. So glad that you have your shirts. They are amazing. We are still trying to decide on the color too. Blue, green, red??? oh the fun of decisions. =0 Way to go getting shirts done! I did Pinterest before Pinterest was invented. For Gavin. For Brady. For Bryce.